Lee Boyce in Men's Journal explains, "If you want to burn fat, you need workouts that are brutal, but short lived. Most metabolic conditioning workouts geared for fat loss allow the body to accumulate lactate (the "burn"), and keep the heart rate up. Cover these bases, and you burn fat — period." While swimmers or triathletes may not want to burn fat like their dryland endurance colleagues or strength-oriented athletes, there are more than a few aquatic equivalent sets of the fat-burning weight-lifting workouts advocated by Boyce. Dryland Method 1 - The Tabata Method: Do a movement explosively for 20 seconds, followed by a 10-second rest, repeat 8 times for an intense 3 minute 50 second set. Repeat these kinds of sets for 6-7 different exercises for a complete burn. 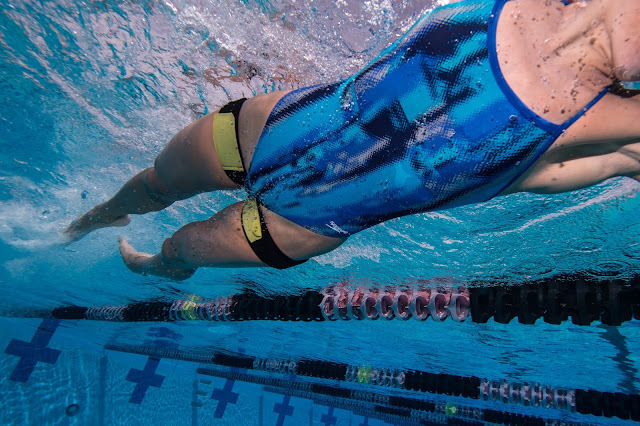 Swimming Equivalent of The Tabata Method: KAATSU Aqua: Swim across the pool with either KAATSU Aqua Bands on your arms or on your legs [see above], approximately 20 seconds of sprinting. Rest 10 seconds and repeat 8 times. By the second lap, your muscles will be screaming. Unlike The Tabata Method, you will not be able to complete this cycle 6 or 7 times. Twice will be all you can handle. Dryland Method 2 - German Volume Training: Do 10 sets of 10 repetitions at 60-70% of your maximum lifting weight (i.e., if you can bench press 100 kg one time, then lift 60-70 kg 10 times for 1 set). Rest 1 minute between sets. Do this kind of set for 3-4 different exercises for a complete burn. Swimming Equivalent of German Volume Training: Do 10 x 50 swims at your fastest average speed (i.e., if you can swim 50m butterfly in 40 seconds, then swim 10 x 50 @ :50 intervals). Do one set butterfly, one backstroke or breaststroke, another set butterfly, and the final set freestyle. Do a deck-up at the end of each 50 when you pull yourself out of the water and then dive in again at your selected interval. Dryland Method 3 - Extended Set Training: Lift your 10-12 rep max (i.e., the maximum amount you can lift for 10-12 repetitions) two times. Rest 10 seconds, then do 3 repetitions. Rest 10 seconds again, then do 5 more repetitions. Rest 10 seconds again, then do 10 more repetitions for a total of 20 repetitions. Do 5 rounds per exercise and 2 different exercises for a complete burn. Swimming Equivalent of Extended Set Training: Swim a 50 at your fastest 200m pace. Rest 10 seconds. Swim a 100 at your fastest 400m pace. Rest 10 seconds. Swim a 200 at your fastest 1000m pace. Do this ladder 5 times freestyle followed by 5 more times with a different stroke. Dryland Method 4 - Barbell Complexes: Do 3 complimentary lifting exercises in a row without putting the bar down. Do 5 sets of these complexes with a barbell, resting 2–3 minutes between rounds. 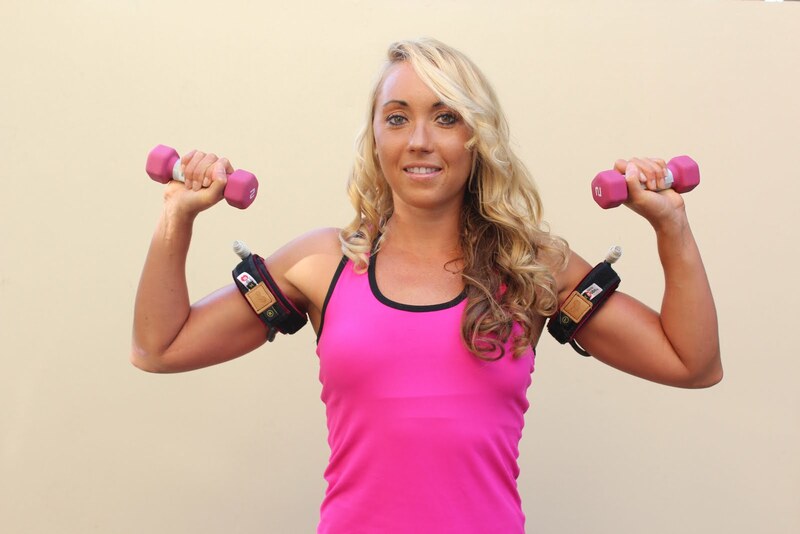 Then finish with 1-2 more complexes using dumbbells or barbells for a complete burn. Swimming Equivalent of Barbell Complexes: Do a 100m swim fast, pull yourself out of the water without resting, and do a series of push-ups, lunges or squats to failure. Alternatively, if there is a 1-meter diving board in the pool, do pull-ups on the diving board while hanging in the water. If you cannot conveniently pull yourself out of the pull, do vertical kicking instead [see photo below]. Do 5 sets of these swimming complexes, at least one of each stroke. Finish with a 50m swim all-out, do a deck-up without resting, and your least favorite dryland exercise. 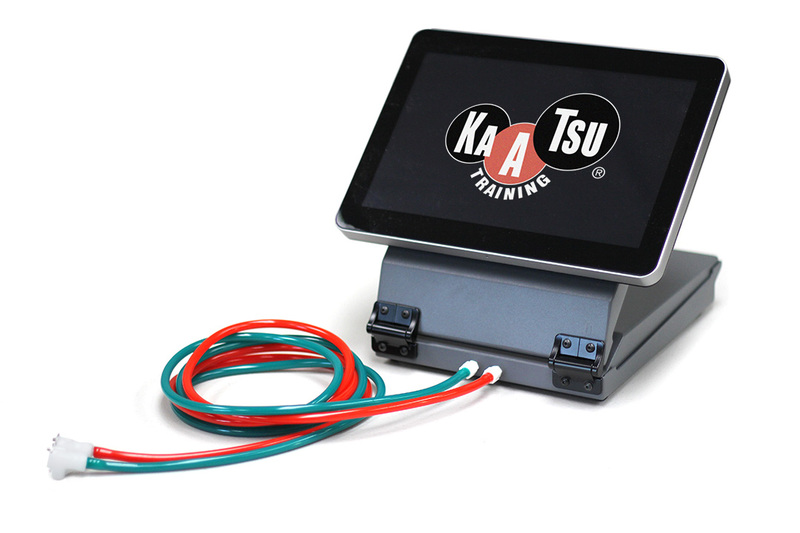 What Happens When You Max Out On The KAATSU?